Back in the day I loved a good slumber party. Me and a few of my best gal pals just watching videos, listening to music, painting our nails, gossiping about boys. Oh and all the dancing, giggling, and pillow fighting....what memories! Now I have a little girl of my own and she loves slumber parties just as much as I did. Girls are so fun! Anyway, someone over at EA Games knows what girls and pajama parties are all about! 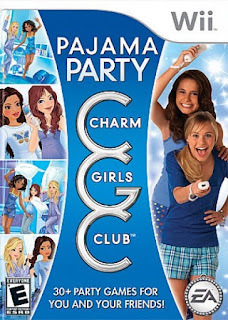 Their game Charm Girls Club Pajama Party is a hit with the tween set. You get to make your own character then start playing a ton of fun games. This video game offers lots of mini games that your girl is sure to enjoy. You can jump on the bed, style your hair, and all sorts of other cool stuff. Your character goes around collecting charms and having fun. My 10 year old loves it! This game is great for girls to play on their own or with a group. I can only imagine what a hit it would be for a slumber party. We may just have to try that soon. Anyway, we enjoyed the game. It kept Ashley entertained for hours. I really liked that it was an enjoyable game made for girls, as I feel there aren't too many of those around. So, definitely keep it in mind this holiday season.